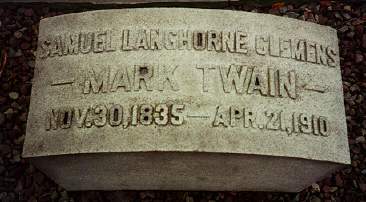 The Grave Yard Rabbit Travels Wright: Mark Twain has a new book out! Several years ago I went to Elmira, NY to find the house my mother and her family had lived in. While I was there I had to go and see Mark Twain's grave and his home. I always loved Mark Twain's books and I am sure I have read them all, some a couple of times. I was so happy when I discovered he has a new one out! A hundred years after his death. How could this happen? The last years of his life he dictated his autobiography. (side note: he had an affair with the lady who took dictation and typed it up, then he fired her) He wanted to be perfectly honest, yet he didn't want to hurt the feelings of anyone. So he requested that it not be published for a hundred years. As one reporter said, "It is the best marketing scheme ever." I am certain that Twain could not have imagined that thousands of copies would be pre-ordered on line. I can't wait to get my copy! A note to genealogists: Twain(Clements) has no direct descendants.